The animals who wind up on the world’s dinner plates have been made invisible by a cultural structure that thrives on keeping cruelty hidden. In today’s Thought for Food column, animal advocate Lea Pickard – whom you might remember from Episode 156 of our podcast – tells the story of how she shed those cultural blinders to truly see the animals around her. 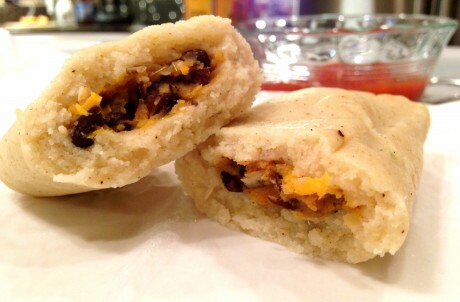 She also gives us a tasty recipe for Sweet Potato and Black Bean Chuchitos – her version of Guatemalan tamales. Food for your mind and body! 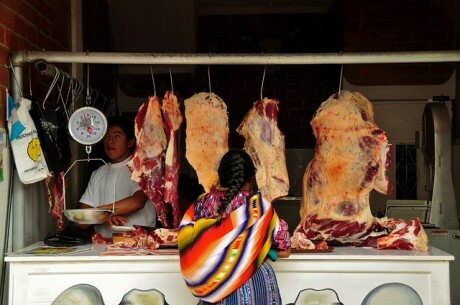 During my twenty-fifth year of eating cows, I traveled to Guatemala to do research for a graduate program in anthropology. While there, I immersed myself in the culture. One day, I found myself in a vibrant, bustling market in the second largest city in the country, Quetzaltenango – known to the locals simply as Xela. It was there, in that wonderful market, surrounded by beautiful colors, that I spotted a little dog – a chuchito. This dog seemed overjoyed to be carrying what I thought at first was a stick. However, as I looked closer, I realized the stick had a hoof; the chuchito was actually carrying a cow’s leg! Unable to look away, I could see each of the claws on the foot, and even make out the individual black hairs on the leg. 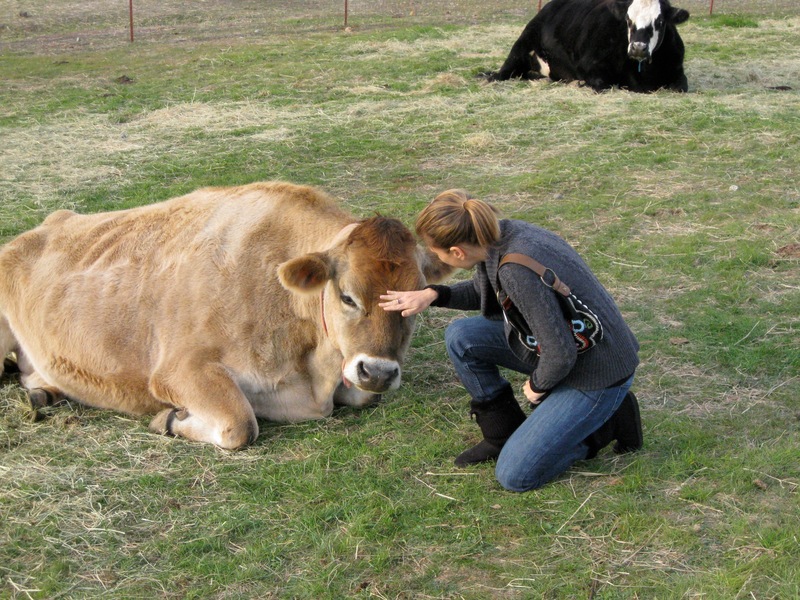 Seeing this cow – really taking a moment to digest what I was witnessing – changed my life. 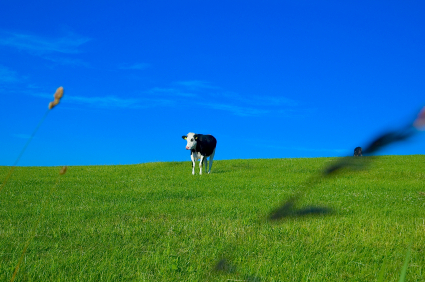 In that instance, for the first time, a cow became a visible individual to me. I’m not sure why it took my whole life up until then for the light switch to go on, but once it did, everything changed. I was truly heartbroken. I made the decision to never eat a cow again, and in a flash it became difficult to understand how I ever had. In my mind, I had always been able to see the faces of individual dogs – my fluffy white puppy Chippy, my stocky little friend Merlin – so obviously I would have thought it preposterous to ever consider eating the chuchito who ran by. But the cow had been elusive to me my whole life. As a little girl, when I requested “extra juice” on my steak, my well-meaning parents never even thought to tell me that this was actually a protein that helps store oxygen in the muscle of the cow. Like most children in our culture, I had been taught to keep that cow invisible. This invisibility on a personal level reflects and reinforces invisibility on a structural level. Anyone who is familiar with Dr. Melanie Joy’s work on carnism, or Timothy Pachirat’s extraordinary book, Every Twelve Seconds: Industrialized Slaughter and the Politics of Sight, understands the role the invisible animal plays in the structure of our society. Even as an anthropologist who held a deep belief that no culture was superior to another, my first thought when I saw that cow was, “I cannot believe they do that!” I had been confronted with what I perceived to be cruelty in Guatemala. Cruelty there. Yet, in the United States, there is almost complete invisibility of the production of animals used for food, despite the fact that 10 billion land animals are killed for food each year. When forced to confront my own assumptions, I became personally aware of the power of wearing cultural blinders, of only seeing a partial picture, and of invisibility. This self-deception results in the suppression of compassion. Visibility, on the other hand, seems to foster compassion. Cultural blinders are powerful. Becoming aware of them allowed me to remove these blinders, which ultimately led me to learn about the horrific cruelty inherent in factory farming. It led me to realize that this is happening right in my own backyard, and in yours. The scale and severity of animal agriculture is shocking, yet shockingly real. This dichotomy touches on what is perhaps a great irony: Americans consider freedom of choice to be a core cultural value, yet our cultural blinders actually limit our choices. Like many vegans, when I found out about the horrors of animal suffering in food production, I was upset. But I was not only upset for the animals – I was upset that I did not know. “What is wrong with me?,” I thought. “How could I not have known? How could this have been kept from me?” Once that light switched on, I was finally able to see. It’s ironic, therefore, that there is a common societal myth that the lives of vegans are limited. 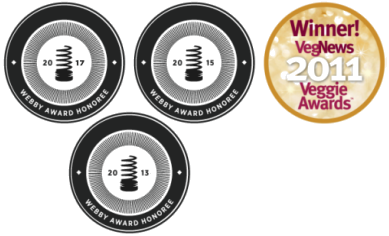 We’ve all heard people say things like, “Oh, veganism must be so hard.” From the perspective of many vegans – certainly those who are vegan because they do not want to contribute to animal suffering – it is actually those who are still wearing these cultural blinders whose lives are limited, whose choices are stifled, and who are not truly free. When we take off the blinders, the choice to be vegan is easy. And our lives are anything but limited. Visibility also brings power. The way that experience in Guatemala impacted my life is immeasurable, shaping everything from how I teach classes at a small liberal arts college, to what I eat each and every day, to how I raise my son. While it can seem daunting to fight the structural invisibility of killing animals and turning them into meat, it is easy to start by keeping our cultural blinders off and working to make those animals, and their deaths, visible for those around us. Ultimately, cultural blinders hurt all animals, human and non-human. 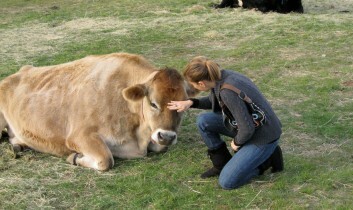 Seeing animals as individuals – really seeing them – removes these blinders and shines a bright light on our compassion. Guatemalan cuisine is known for hundreds of varieties of the ubiquitous tamale. One of these is known as the chuchito (“puppy” or “little dog”) – it is slightly smaller than other tamales and traditionally wrapped in corn husks, whereas most Guatemalan varieties are wrapped in banana leaves. In honor of that chuchito I saw in the market 15 years ago, I am sharing my fall-inspired, vegan version of the Guatemalan chuchito tamale. Making traditional tamales has a reputation for being a labor- and time-intensive endeavor. These chuchitos are easy to put together, full of good-for-you ingredients, and, of course, free of any animal flesh or animal byproducts. There is not a lot of spice – nor heat – in traditional Guatemalan tamales. In this way, I have kept this recipe true to traditional chuchitos, allowing the flavor of the ingredients to shine through. The coconut oil adds a hint of nutty sweetness that, when paired with sweet potatoes, black beans, and a touch of cinnamon, makes a perfect snack or meal as the weather becomes cooler. Rather than using corn husks used for the chuchitos, I use parchment paper to steam them to fluffy, corny perfection. Feel free to use corn husks or banana leaves if you’d prefer. This recipe calls for one cooked sweet potato, so be sure to have that prepared in advance. Mix together the masa de harina and baking powder in a large bowl. Add the coconut oil and water. 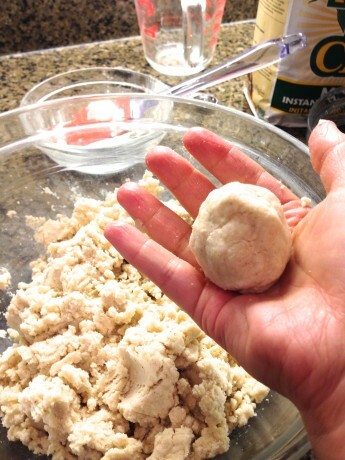 This mixture should have a doughy yet still slightly wet texture, and easily form a ball. Chop the onion and add to a pan with about 1 tablespoon of water. Cook over medium-high heat and stir often until it begins to turn translucent and soften, about 5 minutes. Add minced garlic and cook another minute. Remove from heat. 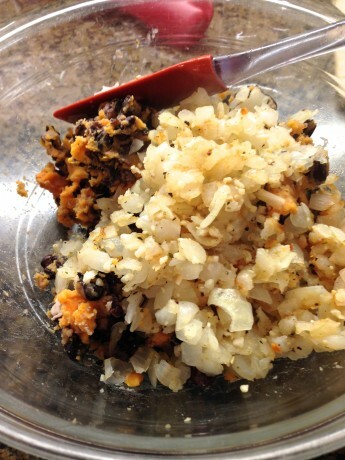 To make the filling, mix together the black beans and mashed sweet potato in a bowl. Use a fork or your hands to slightly mash the beans. The mixture should still have large pieces of beans. Add cooked onion and garlic, salt, and cinnamon. Mix well. 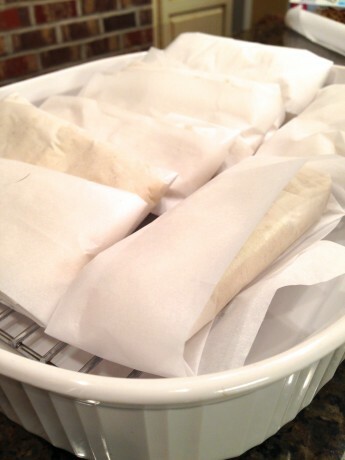 To assemble the chuchitos, lay out a sheet of parchment paper. Add 1/2 cup of the masa dough to the center, flattening and evening until it is about 1/2” thick, forming approximately a 5” X 5” circle. 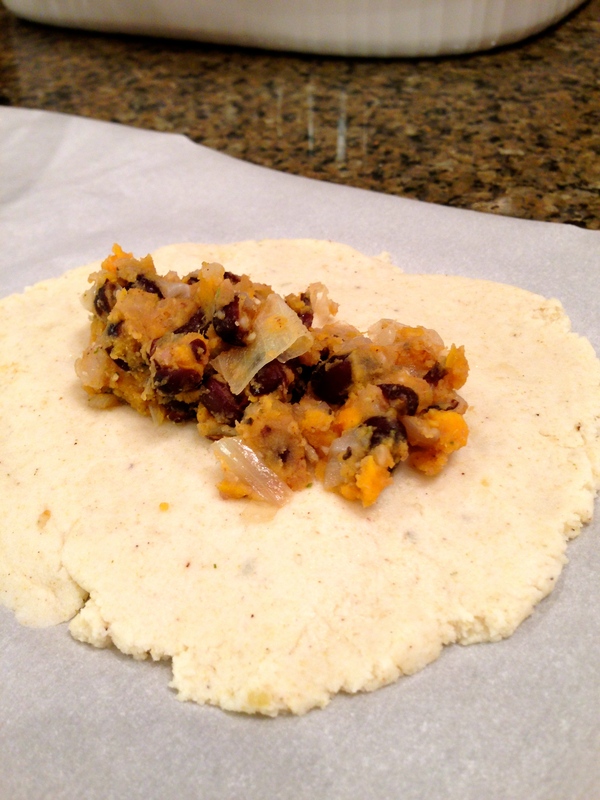 Add 2 tablespoons of filling to the center of the masa circle, leaving about 1” of masa showing. Draw the parchment paper together so that the opposite sides of the circle touch and seal in the filling. With your fingers, seal the short ends. Roll the chuchitos into the parchment, long end first, then fold the remaining paper over each end, creating a little envelope for the chuchito. Repeat the process so you have 8 chuchitos. Place chuchitos on a raised wire rack in a baking dish, pouring just enough water in the bottom of the dish so that the level of water does not touch the wrapped chuchitos. Seal pan with aluminum foil. Bake for 45 minutes. Turn oven off and let sit in oven 15 more minutes. Take the pan out of the oven and remove the aluminum foil. Let sit just long enough to cool slightly, approximately 5 minutes. Unwrap your little presents and enjoy your chuchitos with salsa and your favorite hot sauce. ¡Buen provecho! Lea Pickard with Mario, at Farm Sanctuary in Acton, Calif. Mario was discovered on top of a dairy farm’s dead pile, helpless and with a broken leg, before eventually making his way to Farm Sanctuary. Lea Pickard is a nutritional anthropologist who shares healthy, vegan food in her nutrition and cooking classes as a Food for Life instructor. She and her partner in crime, Doug White, have been enjoying cross-cultural adventures for 15 years. Together, they have three kitties, one fluffy rescue pup, and a 19-month-old busy-bee toddler, Jack. Lea also teaches yoga and has started writing about her compassionate household, vegan parenting, and the quest to keep animals visible at The Vegan ABC’s. Thank you for this wonderfully cogent consideration of the visible/invisible dichotomy. A couple thoughts: first, I suspect that in order to "see" the animals in our daily lives, we must also learn to "see" the animals in our language. Here, that would mean acknowledging that "blinders" are equipment used on horses to make them easier for humans to manage, that this metaphor depends on and gestures toward the violence we do to horses. Second, I worry about putting so much emphasis on, and investing so much hope in, sight. A line between humans and animals is often drawn by contrasting our reliance on sight with animals' reliance on smell. (Freud, e.g., links human civilization with our species' standing up straight and an associated "diminution of the olfactory stimuli...Their role was taken over by visual excitations.") So what if celebrating our ability to see actually reinforces the dichotomy that we're trying to dismantle? More importantly, maybe, I wonder where this emphasis leaves humans who are blind. 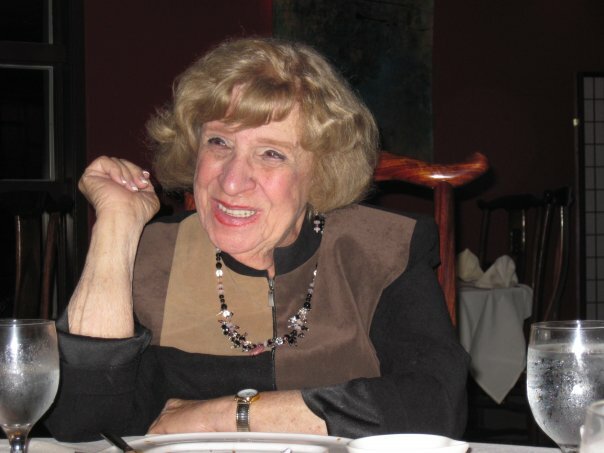 Lea Pickard "was finally able to see"; many humans -- and other animals -- aren't ever able to see. But of course they can still cultivate compassion -- and they can "digest" what they experience, and they can take part in "witnessing" others' suffering. I guess I'm suggesting that in order to avoid reinforcing an ableist attitude toward blindness, we might want to shift the emphasis from "seeing" to "witnessing." Thank you again!